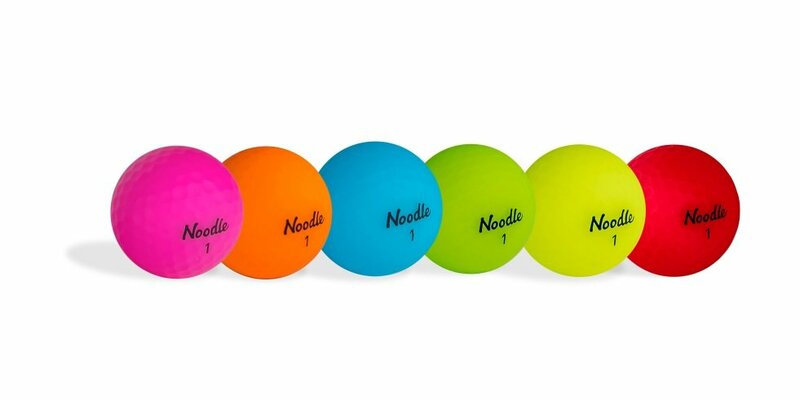 Noodle® Brand Relaunches with Unveiling of Noodle Neon Golf Balls – "The Home of Organic Golf Reviews"
Neon and fluorescent coloured golf balls are in. Sales for this type of golf ball is estimated at $50M worldwide. It proves that coloured golf balls are “in” although not necessarily everybody’s cup of tea. Personally speaking…I love them! I just find with my vision not being the best I can track them much easier… especially in overcast skies. And yes they are fun and different. So… Who remembers Noodle golf balls? You know those low-cost golf balls that were surprisingly soft and long that really were great bang for the buck. Well the Noodle is back with a relaunch. TaylorMade Golf announced that along with the relaunch of their traditional white Noodle golf ball they are also releasing “high-viz” versions. These golf balls will come in matte finishes and be available in 6 colors. Use of UV Inhibitors and UV Stabilizers help prevent discolouration. Below is the press release as shared by Nick Obritsch who is the Marketing Manager of TaylorMade Golf Canada. Carlsbad, Calif. (January 23, 2018) – Noodle, the most recognizable name in the long & soft category of golf balls designed for the recreational player, has announced today the relaunch of its iconic Noodle brand with the philosophy of pure enjoyment of the game while playing better. Noodle’s relaunch is led by an expansion of its traditional Noodle golf ball line with the release of Noodle Neon, a collection of high-visibility, fluorescent-coloured matte finished golf balls in six vibrant colours designed to add an element of fun to the game while stand out at address, during flight and on the green. Made famous by the original Noodle Long and Soft, the New Noodle Neon is a two-piece golf ball with an extremely soft compression (62) and a soft aerodynamic cover that offers durability and distance. The core of Noodle Neon uses a patented REACT Core Technology that reduces compression and maintains rebound for maximum ball velocity. The cover blend consists of several ionomers with different metal ions known to create synergy for more speed while maintaining excellent durability. Many golf balls in the high visibility space suffer from the severe fading and discolouration of fluorescence when exposed to UV light. With Noodle Neon, TaylorMade’s engineers successfully created a product that withstands the elements and maintain colour. Noodle Neon utilizes a bright white core, high visibility colourants in the cover and a proprietary matte paint that gives the ball a distinctive appearance when compared to standard gloss golf balls. The colourants used in the cover and matte paint include both UV inhibitors and UV stabilizers. UV inhibitors prevent the oxidation of the polymer that cause premature yellowing/colour shifting and UV stabilizers prevent UV light from causing discolouration. (most important feature of product). Available at retail on March 15, 2018 at $19.99 dozen, Noodle Neon will be available in Matte Lime Green & Matte Red as dozen ball packs, while additional colors will be sold as mixed 6-dozen bulk packs inclusive of Matte Pink, Matte Orange, Matte Blue & Matte Yellow.